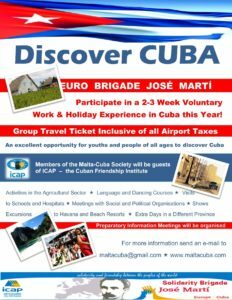 Each year the Malta Cuba Society participates in two international events in Cuba, namely the “May Brigade” and the “Jose Marti Brigade”. The May Brigade takes place between April and May of each year, whilst the Jose Marti Brigade takes place in July. The Brigades consists of groups from the solidarity and socio-political organisations of several European countries mostly youths. For the May Brigade participation is also from youths all over the world. Members of the Brigade spend three weeks in Caimito – Havana as a ‘Brigadista’, working and socialising with Cubans and people from all across Europe. 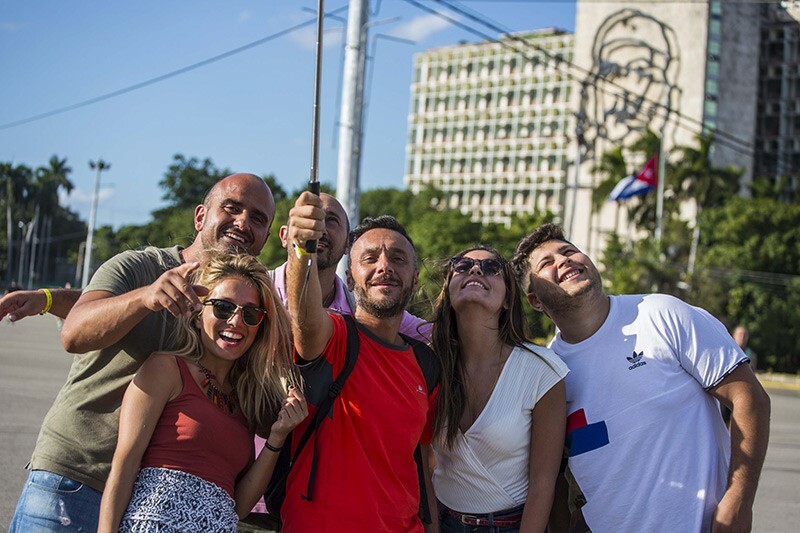 It is a unique opportunity to experience the Cuban Revolution first-hand and show that Cuba is not alone. The cost of the whole package is 576.00 CUC. These includes: accommodation in shared rooms up to 6 people (in the case of Julio Antonio Mella International Camp, CIJAM); single, double or triple rooms (depending on availability at the hotel) in Camagüey; with full board (all three meals); airport transfers (in–out) and transportation to all the activities included in the program. Since the CIJAM maximum capacity of lodging is 220 people, it is important to receive confirmation of your participation in this brigade in the established timeframe. After completing this capacity, the late received confirmations of participants will have a different accommodation alternative with a higher cost. The program includes 14 nights of stay: out of them 10 at the Julio Antonio Mella International Camp (CIJAM), located in the Caimito municipality, some 45 Km from Havana, and 4 nights in a hotel in Camagüey province.